Replaced my Ultegra 6800 derailleur with the new one and right away noticed an improved smoother shifting and quieter than the old model also its designed to be more hidden to prevent damage. Sleeker design and color probably one of the best upgrades for your bike. In the process of switching several of my bikes over to 11-34 cassette compatible which requires the RD-R8000 mid-cage derailleur. Have ridden Shimano Dura-Ace and Ultegra lines for years. Ultegra delivers excellent quality and performance at a more affordable price. Definitely recommend this derailleur if you want to be able to accommodate up to 34 tooth cassette. Upgraded from a three-year-old 105 derailleur. The new ultegra provides a noticeably crisper, more defined shift from a worn out 105 - longish cage accommodates 32t with ease. Why use anything else . . . Excellent for running an 11-34 cassette. 20% grades only hurt badly now and aren't killers. This derailleur allowed me to upgrade my cassette to an 11-30 cassette and its just been great. The shifting is quick and smooth and it just looks great too. The trickle down technology from the Dura Ace, makes this decision a no brainer. Works flawlessly like most Shimano products. Improved version with extension link. You need this for cassettes over 28 teeth, i.e. 32, 34 etc.. Because of the dog-bone link extension, it works more like a short-cage design. I don't notice any difference in shifting. This derailleur replaced the earlier Ultegra version. Very happy with the performance. This RD-R8000 derailleur is so smooth and accurate I'm not sure why you'd spend $100 or more on Dura Ace? I bought this derailleur for my 1X cross bike. It worked flawless with a narrow wide chainring, 11-30 cassette and a chain catcher for a full season of cyclocross. Comparing it to my XTR 9000 derailleur, its basicslly the same design without the clutch. The short cage is longer than the previous version so it has more Tooth capacity. The B knuckle on the Ultegra is the exact same size as the current XTXTR so you can use the WolfTooth Goat link perfectly and run up to an 11-40 cassette with no issues. The chain tension spring is stronger than the previous generation derailleur and there are two tension settings. It comes stock in the lighter setting. 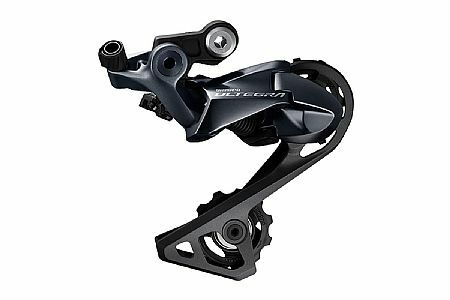 Because it uses the Shadow design, the derailleur doesnt stick out as much as the older design so its more protected in the event of a crash. Bought this to climb the mountain in VA with grades of 12% to 22%, this shifts like butter. The new derailleur will give me more options for climbing hills and mountain passes. As always ultegra offers smooth shifting and dependability.